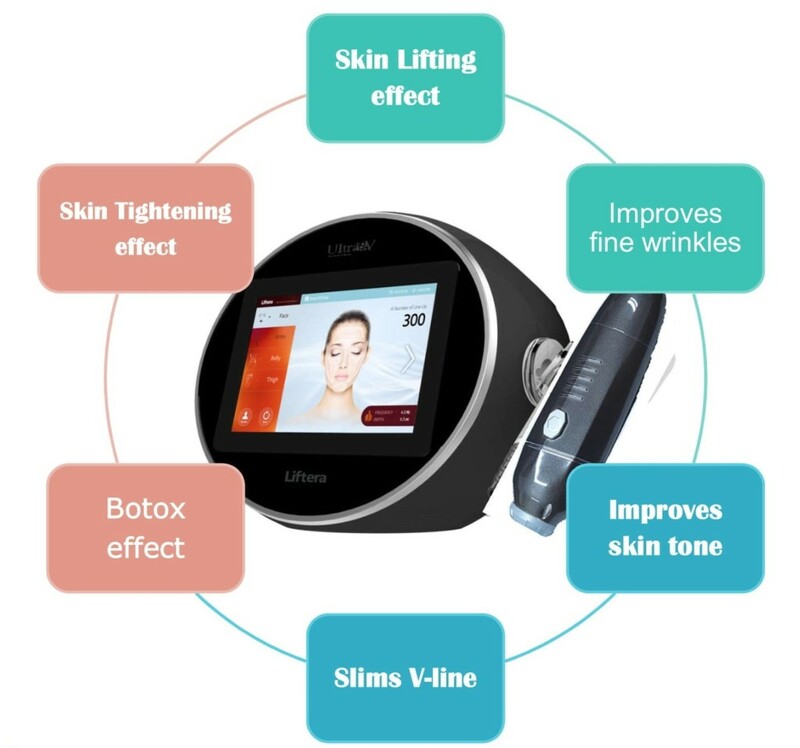 Ultra V HIFU Plus Lifting is a remarkable breakthrough in technology, offering a truly non-invasive alternative to a surgical face lift, a MUST have treatment option with a specific intent for improvement of lines and wrinkles on the face and décolleté, penetrating to the depths previously possible only with surgery. 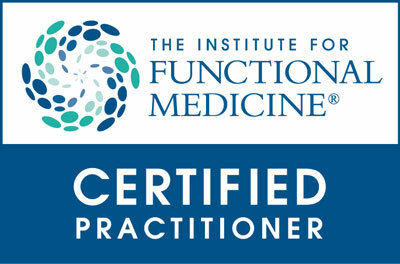 As we age, the supportive fibres under the skin tend to weaken and slacken. 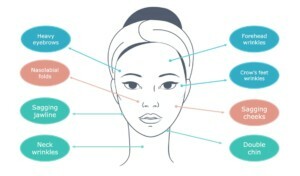 By targeting the connective tissues in the face, HIFU’s non-surgical method treats sagging skin and fine lines by jump-starting the natural collagen rebuilding process. This facelift treatment looks to create a tighter, firmer, regenerated complexion and more defined jowls (Individual results may vary according to existing condition). Each session is dependent on the treatment area. One treatment session takes just few minutes. Your treatment will be tailored to your individual requirements which will be discussed in your pre-treatment consultation. Additional time will be required if you require more areas. Individual results will differ, however on average a minimum of 6-12 months. 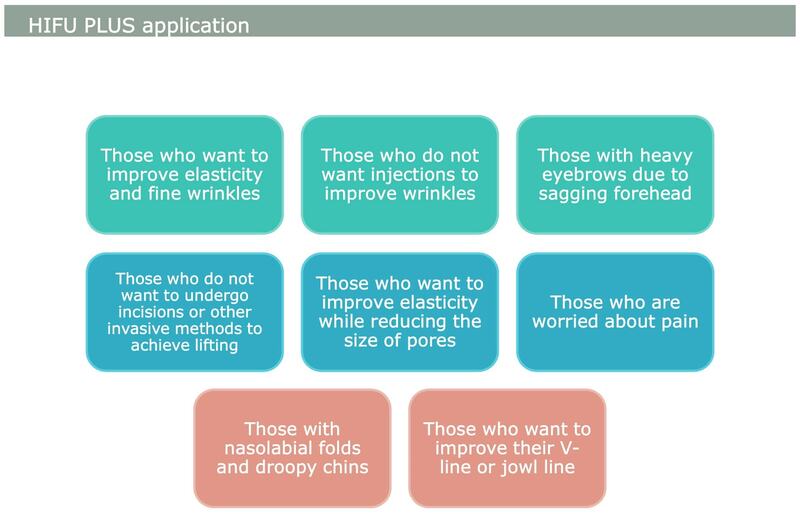 Anyone with drooping skin or considering a face lift but isn’t ready for surgery is a good candidate. A consultation is always needed as this will give us a chance to assess your requirements and will help us to understand what results you are looking for, so we can find the perfect solution for you. Q Does it interfere with everyday life? Because it is applied to the deep layer of the skin without damaging the surface of the skin, daily life such as make-up and washing after the procedure is possible. Temporarily, there may be a feeling of throbbing or stiffness in the deeper layer of the skin, but some people do not need anesthesia because the pain is not strong. The affordable price of the equipment and consumables makes it cheaper than existing lifting devices. HIFU PLUS is KFDA-certified equipment that has been approved as 100% safe lifting device. Q When will I see the results? The effect may start showing as soon as the same day as the procedure, and for the next two weeks you may experience a pulling and tightening sensation, which means that collagen is regenerating, and you will see a lifting effect after 1-3 months. Ultrasonic energy output speed is fast, and the operation time is 15~20 minutes. Q Can I use it together with dye laser? The dye laser acts on the skin epidermis and upper dermis, and HIFU PLUS acts on the lower dermis and fascia of the skin, so it is possible to use them together. Q Is one session enough? Since the aging of the skin continues after the procedure, we recommend that you periodically perform the procedure for maintenance. Q After the treatment, will my cheeks look too sunken? If you do not have a lot of fat on your face, you do not have to worry about adjusting your strength and practicing it at the right level. Q I have a fat transplant. Can I still get the treatment done? Since it takes 3~ 6 months for the transplanted fat to engraft, it is recommended to wait before the treatment. 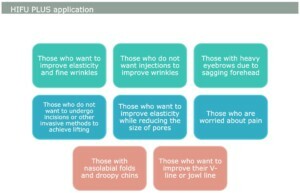 Q Can I get the treatment after plastic surgery? It is recommended that you let the skin heal after such treatments, as facial contour, for at least 3 months. Q Is the effect better with higher number of shots? The higher the number of shots, the bigger the effect, but since each individual has a different degree of deflection, please ask for adequate shots after sufficient consultation. Q I have recently been injected with fillers. Can I still get the treatment? We recommend waiting at least one month after filler injections. Q Is it suitable for sensitive skin? Skin may become a little red on the day of the procedure, but because it is applied to deep layers of the skin, the discomfort is tolerable if you take it at the appropriate settings. Q When should I get the next treatment? Depending on the intensity of the procedure and the condition of your skin after 6 months after the first treatment, it may help to maintain good skin if you are treated periodically once every 6 months to once a year.